Special low pricing for April 2019! Get away to the North Carolina Blue Ridge Mountains and experience a true holiday. This unique log cabin, named Hemlock Heaven, is made of massive Hemlock trees creating a Paul Bunyan-like look that will amaze and intrigue any traveler! Hemlock Heaven is situated on nearly 20 private acres. The cabin seems 'out in the middle of nowhere', yet is only three miles from Banner Elk where there is skiing at Beech and Sugar Mountains, great restaurants, shopping and lots of activities! 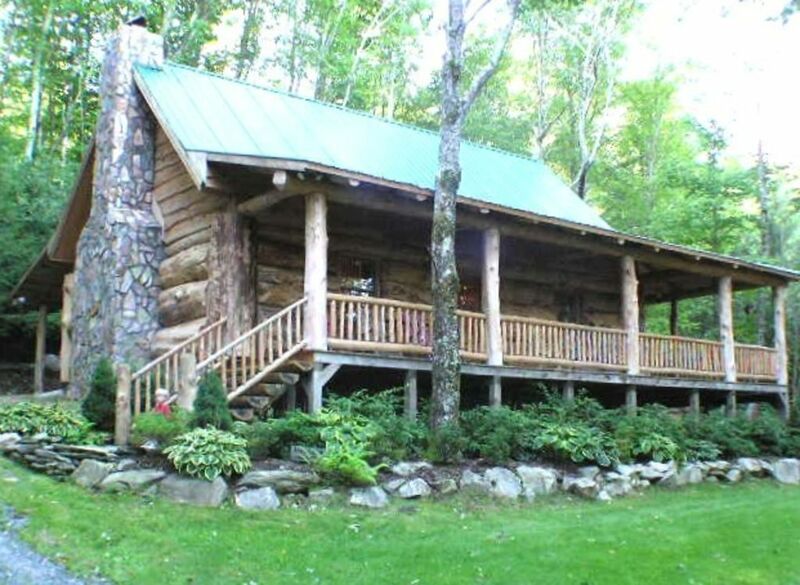 This log home with it's many cabin comforts, is sure to please. Beautifully furnished with primitive antiques, a fully equipped kitchen, wi-fi, television with Netflix and all the linens and towels you need in your vacation home away from home. Sit on the wraparound porch in your rocking chair and enjoy the privacy and serenity, take a nice bubblebath in the 1920s clawfoot bathtub, or kick back in front of a beautiful fire in the big stone fireplace on a cool night. This is a wonderful place for a romantic getaway, a small family or several couples. Bathroom is downstairs with a claw foot bathtub and shower. Washer and dryer are located in the bathroom closet. Mr. Coffee maker with filters in the cabinet. Have some DVDs from the last decade. We have some board games, dominoes and cards. Wonderful cabin and an amazing stay. Highly recommended. This cabin is a gem. The dreary weather during our stay only gave us more time to enjoy the home. We marveled at the gorgeous log construction, we couldn’t get enough of the fireplace, the spiral staircase is a showstopper, the kitchen is adorable (we played a lot of Uno around the kitchen table and had a blast) and the views are lovely. The water in the bathroom ran strong and hot, which is just how I like it. The porch is perfect and the rainbow colored rocking chairs are a perfect accent. Truly, we cannot say enough about this adorable cabin. It made me want to buy my own cabin in Banner Elk. Can’t wait for our next visit. Thank you! Just booked this for my husband’s Birthday! So relaxing! Very special place to get away & relax! Only a few miles from Banner Elk & all ski resorts!! You will love it & we’re coming back!! We loved our weekend in this cabin. Everything was immaculately clean and very comfortable. Everything was so clearly labeled and anything you could possibly need was at the cabin. One of our most favorite places we have every stayed. We couldn't rate it any more highly! What a treat. We found this cabin last minute and couldn't have been more delighted. Very nice real log cabin and beautiful private property. Very clean and neat. The owners are very responsive to anything you need.